The promise of the new generation of lunar orbiters is beginning to be fulfilled. JAXA has just released a topographic map of the Moon based upon the equivalent of two weeks of data collection with their laser altimeter. This is a significant improvement over the best existing map based on Clementine data. 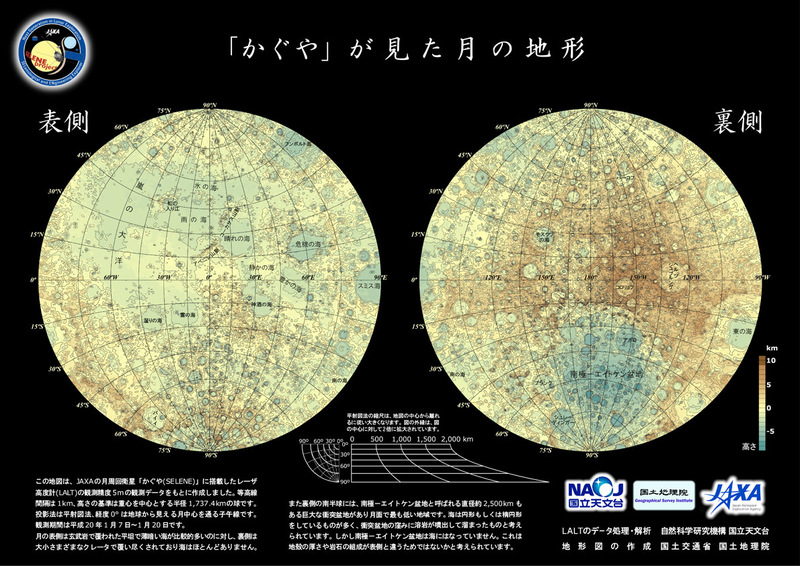 According to information provided by Junya Terazono on the Lunar-L Listserv the Kaguya map contains 1,130,000 points, about four times as many as used for ULCN 2005, based on Clementine data. The map also has contours at the kilometer level so smaller intervals of elevation can't be determined. At the very reduced scale reproduced above the details are not visible, but even with more than one million points in the original there is still not the resolution needed for careful studies of craters. For example, Alphonsus is defined by only one contour interval, and it and many other craters have a squarish shape. Inclusion of many more data points in the coming months will result in much more useful detailed topography. But no map of an entire world can show great detail, its value instead is in revealing regional trends. For example, I did not know that Mare Crisium is deeper (4 km below the global average) than most of the other nearside maria. Adjustments in Photoshop to make the somewhat bland color palette wider reveals that Crisium, Smythii and Humboltianum are the only nearside maria as much as 4 km below average. There are only three other areas on the Moon with similar or greater deeps. As is well known, the broad South Pole-Aitken Basin is deeper. Two other provinces 4 km or lower in elevation are discontinuous broad areas with low crater bottoms. The first province is in the nearside southern highlands, centered near Lilius, but extending to the crater Humboldt. And the second is a farside northern region centered at about 100°E, 60°N. I didn't know there were broad areas of common crater depths. What does it mean? A mercator projection map is available from the Japanese page of the Kaguya Image Gallery. Click the top link under the red What's New column. JAXA has now released DVD quality versions of two of its first videos of Earth rise and set, with more promised. From the Image Gallery chose HDTV option. Yesterday's LPOD: Is It Really There? This page was last modified on 9 February 2015, at 00:14.